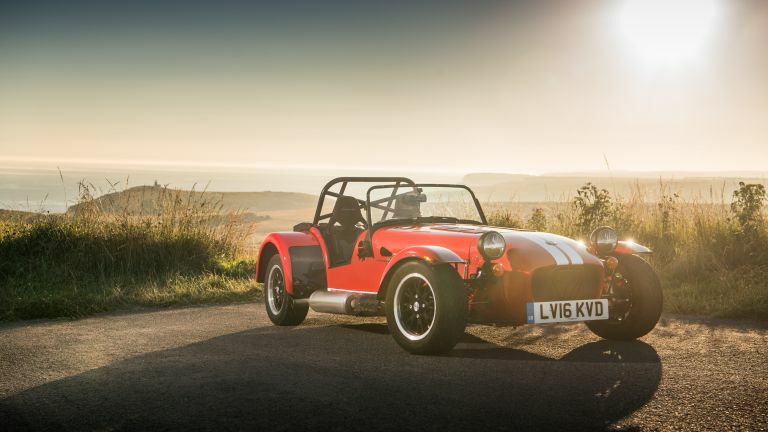 Taking a break from driving massive SUVs packed to the suede-headlining full of technology, we recently hopped into a Caterham 310R to experience a different, more engaging style of motoring. To make the most of the beautiful summer we had/are still currently having, and to get to grips with our new toy, we took the Caterham to some of our favourite places in the Cotswolds. The 310R sits squarely in the middle of Caterham's range, at the bottom is the Seven 160 which can feel a little underpowered, while at the top of the range is the 620R, which is more dangerous than a serial killer. The 310R has a 1.6-litre engine which produces 152bhp, creating a beautiful balance between power and weight. "That's the perfect spec," I was told by the guy dropping it off, and, after driving it for a while, we're inclined to agree. That 1.6-litre engine will propel you from 0-60 mph in 4.9 seconds, and onto a top speed of 127 mph. While we've certainly driven cars faster than that, we can honestly say it's plenty fast enough in such a small, lightweight , no-nonsense car. Once you've managed to climb in and get comfortable (easier said than done, especially if you're over six foot), blasting through twisty Cotswold roads feels unlike anything we've experienced before. You get incredible amounts of feedback from the steering, brakes, and suspension. You can feel every bump and surface change in the road. As you start to build speed the noise of the engine is drowned out by the whine of the gearbox and rear axle, as well as the wind rushing past your head. It’s incredibly exciting, very addictive, and also a little bit scary. This is the part of the review we'd usually use to talk about the technology included in the car, but on this occasion, the options list is a little lacking. There’s a fan (standard) and a heater (that's optional). That's it. There's no radio (you wouldn't be able to hear it even if there was one), sat nav, or electric seat adjustment. The same goes for driving tech, there’s no active torque vectoring, no traction control, and no ABS. This perfectly exemplifies Caterham's ethos of simplicity, lightweight, no-nonsense driving. The Caterham 310R starts at £28,990, and for that you have to build it yourself. If you don't have the time, or the technical-knowhow to construct one yourself, it only costs an extra £2500 to get Caterham to build it for you. You can read more about it on Caterham's website. During our time with the Caterham 310R we realised there are several essential items of clothing you'll need when driving one. The first of which is a good pair of driving shoes. The thin soles are great for communicating pedal feedback, and the narrow design makes it more difficult to catch two pedals at once. Our favourites are the Tod's Gommino Suede driving shoes, which are named after the 133 rubber 'Gommino' pebbles embedded into the soles. This pair has been made in Italy from brown suede that grows increasingly supple with wear. You'll also need a pair of sunglasses, both to protect your eyes from the sun, and to protect them from wind and debris that might get over the windscreen. And finally, if you're going to go open topped, you'll want a hat. It'll not only stop glare from the sun and stop your hair from flying around, it'll stop you from getting sunburnt, which is very easy to do. Dormy House is a located in the Heart of the Cotswolds, close to Chipping Campden. The converted 17th Century farmhouse is steeped in tradition, with oak-panelled bars, roaring log fires and a two-rosette dining room. The hotel has recently undergone a multi-million pound refurbishment, and now features an amazing luxury spa. Visitors are perfectly placed for the Regency terraces of Cheltenham, the theatre of Stratford-upon-Avon and some of the prettiest gardens and villages of the Cotswolds. Soho Farmhouse is a private members club and luxury hotel set in 100 acres of Cotswold countryside. It's open to Soho House members, as well as non-members, and famously played host to Megan Merkel's hen do recently. It's located on the edge of the village of Great Tew, Oxfordshire, and offers a choice of one-, two- or three-bedroom cabins, or a seven-bedroom farmhouse (from £1,600) and a four-bedroom cottage (from £900). You'll find a selection of five eating venues, topped up with seasonal spaces and a fleet of 19 retro milk floats which deliver food and drink across the estate. A plethora of leisure activities are there to keep you entertained or relaxed, including a Cowshed spa, amazing swimming pool, rowing boats, and horse riding. Soho House members can book a stay directly through their House Seven accounts, while non-members need to inquire directly with the property through the website. The Wild Rabbit, Kingham, is part of the Daylesford estate and has been designed around its food and guests. The kitchen is open so that the theatre of the chefs is always on view, and the atmosphere of the room feels dynamic and playful. Working in tandem with the seasons, the restaurant's award winning chefs create a constantly changing menu that uses natural ingredients in their prime. They use organic ingredients, picked fresh each morning and delivered straight to the kitchen, alongside foraged and locally sourced produce from artisan producers. The dining room is open daily from Wednesday to Sunday for lunch and dinner. The Hare and Hounds, Tetbury, is charming hotel set in beautiful gardens and woodland. It's restraunt, the rosette-awarded Beaufort, offers a fine selection of dishes utilising seasonal and local produce wherever possible. The A La Carte menu combines the best of British with a few infusions from across the channel, but if you're looking for something a little more informal, try the Jack Hare's bar, which also features a seasonal menu but is served in a traditional pub surrounding. Want to drive a Caterham for yourself? Check out the range of experiences available on Red Letter Days and Virgin Experiences.